0304_evlo_evmbmdgirlsstate1: Sports: News-Editorial: Award-Winning Evansville Photographer: Molly Bartels specializing in editorial, wedding and art photography in Evansville, Indiana. 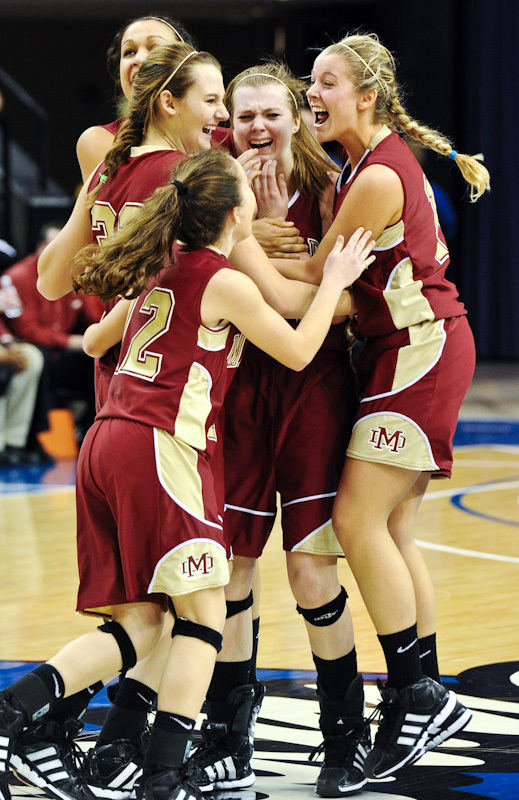 Ashlynn Spahn, front left, Tori Schickel, left center, Brianna Dickerson, back left, and Casey Jochem, right, surround Maura Muensterman, center, after she made the game winning shot in overtime against Fort Wayne Bishop Luers in the 2A girls' state championship basketball game at the Hulman Center in Terre Haute, on Saturday, March 3, 2012. Muensterman's shot left 0.2 seconds on the clock. Bishop Luers then called a time out when they had no timeouts remaining, resulting in a two-shot technical foul. Muensterman made the two free throws to end the game with a final score of 56-52.